The music to the song “Sanctuary” faded out, but the voices of the youths only grew louder. 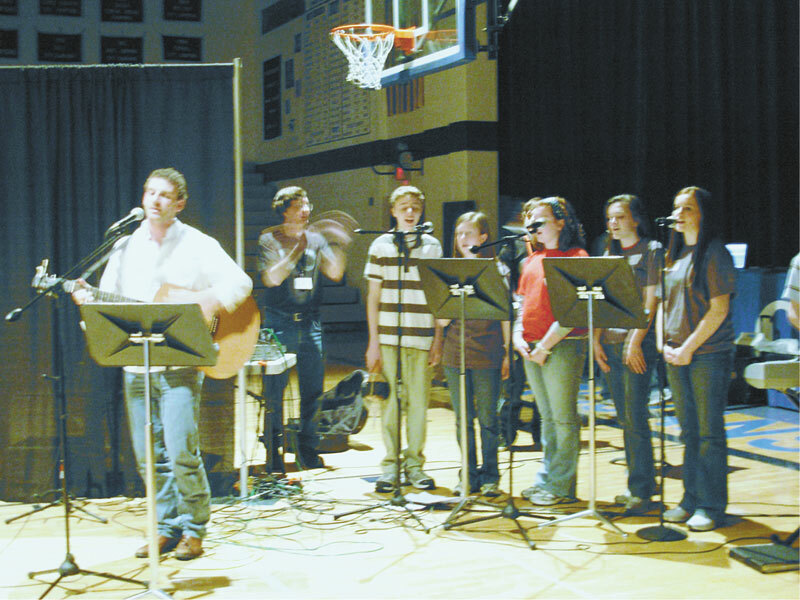 With eyes closed and hearts open, these 550 teenagers prepared themselves for the message of Jesus Christ during the annual Archdiocesan Youth Rally held on March 1-2 at Bishop Chatard High School in Indianapolis. The 2008 theme of the rally was “Infinite.” What became apparent from the moment the youths came to the rally was the infinite eagerness, anticipation and longing they displayed for the Good News. Father Jonathan Meyer, archdiocesan director of youth ministry, touched upon this longing during his homily at Sunday Mass. “We need to break down the barriers and manifest what God wants for us,” he said. Festivities started on March 1 with the pre-rally at Christ the King Parish in Indianapolis, where youths were invited to socialize and play basketball and volleyball. They also had the option of playing board games, video games, corn hole or watching a movie. The evening ended with the Stations of the Cross and adoration of the Blessed Sacrament. Youth rally participants also welcomed Steve Angrisano as the keynote speaker. Angrisano is known for his ministry as a Christian recording artist and motivational speaker as well as serving as master of ceremonies for the 2005 and 2007 National Catholic Youth Conferences. He said he noticed something special about this group of young people. Brian Hanley of St. Gabriel the Archangel Parish in Indianapolis recognized Angrisano and was happy to see him as the keynote speaker. “I attended the 2007 National Catholic Youth Conference and was blown away by his message as well as his singing and guitar playing,” Brian said. Angrisano’s keynote address focused on the youths beginning to recognize that God is all around them. He reminded the teens that God is in everything they do. “We have a God of miracles, not just a God of stained-glass windows. … We have a God who is in this room with us right now,” Angrisano said. After the March 2 morning keynote address, the youths separated into smaller groups by grade levels, where they listened to presentations by other speakers who gave personal testimonies and advice focusing on themes such as love, bullying and friendship. Jeremy Reiss gave a talk to high school seniors on the importance of love, chastity and marriage. Reiss and his wife, Erin, are newlyweds and members of Our Lady of the Greenwood Parish in Greenwood. A key component to Jeremy Reiss’ talk on marriage focused on the commitment to the spouse in marriage. “Love in marriage is about making yourself, as well as your partner, a better person,” he said. Joseph Lorentz, 15, of St. Luke the Evangelist Parish in Indianapolis, attended the group session on friendship. He said he came away with a more comfortable sense of who he is. The youths then divided into even smaller group sessions to focus on topics that are at the core of teenage life. These smaller group sessions allowed the youths to talk one-on-one with each other about the issues of drama/stress, voting, fitting in and what God has planned for them. Joe Connelly, youth minister at St. Monica Parish in Indianapolis, and Janet Roth, youth minister at St. Ann, St. Benedict and Sacred Heart parishes in Terre Haute, hosted a breakout session on the effects of drama and stress in teens’ lives. Roth reminded the teens to ask for God’s intercession. The youth rally participants then gathered for Mass at Christ the King Church. It was a true celebration of music, prayer and faith centered on God’s infinite love and kindness. Father Meyer asked the youths to extend this enthusiasm into their everyday lives. “We need to know Christ on the inside, but we also need to let everyone know on the outside,” he said. The youth rally concluded with a spirited adoration session and closing ceremonies in which the Archdiocesan Youth Council members were recognized for their hard work in planning the weekend event. Kirk Meyers, 18, a member of Annunciation Parish in Brazil in the Terre Haute Deanery, was among those who served as an Archdiocesan Youth Council member. He admitted the work was hard, but ultimately fulfilling. 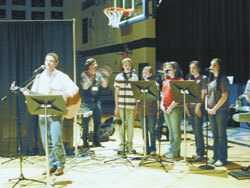 “I was amazed at how everyone was able to come together and worship God in our own way,” he said. Pat Jansen, 18, a member of Our Lady of the Greenwood Parish in Greenwood, who also served as an Archdiocesan Youth Council member, said he came away with a greater confidence in himself and a greater understanding of God’s presence.